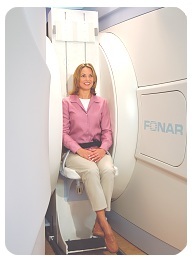 The revolutionary design of FONAR's Upright™ MRI allows patients to simply walk in sit down and be scanned while you watch a 42" TV. The Upright™ MRI allows all parts of the body, particulary the spine and joints, to be imaged in the weight bearing state. The system is equipped with our unique MRI-compatible motorized patient handling system that will move the patient into the magnet and place the anatomy of interest into the center of the magnet gap. It also can rotate the vertically-oriented patient into a horizontal position so the patient can be scanned lying down as in conventional MRI scanning. These are lumbar spine images of a patient who had undergone back surgery but was continuing to experience pain. The image on the left was acquired with the patient lying down. It shows a normal alignment of the vertebrae. 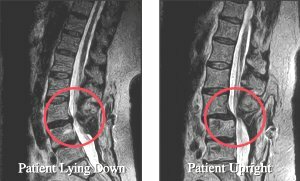 However, when the patient was scanned in an upright position (right image), a dramatic spinal instability was clearly revealed. This problem was visible only when the patient was scanned upright and would have gone undiagnosed on a conventional, lie-down MRI scanner.